Made of a C5 alloy, which is a light, durable and nickel-free material. Interchangeable Unobtainium O logo with a different color on both sides for temples. I purchased these frames due to their design and long arms that wrap around the shape of your head rather than your ears. Personally, they fit wonderfully and my wife says they look great on my face. I have zero cons are far as the frames are concerned, though my lenses were a bit off. Of course I assume the lenses are a frequent problem, especially when ordering them online. 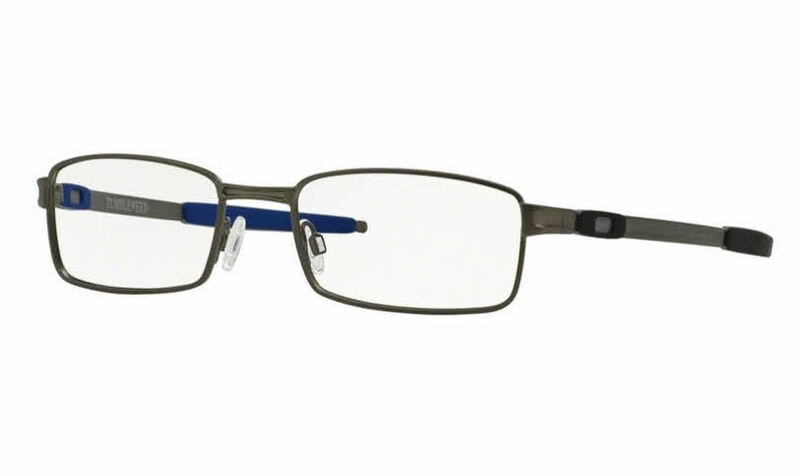 Regardless, I would definitely recommend these frames to anyone looking for comfort and style! I really like this frame with its straight temples, classic appearance, and color. I waited for Oakley to produce a new model that was similar, just to have a newer model, but when nothing came out similar I just bought this one again. I hope I will be able to get the temple sleeves still when needed (inevitable over time). Probably should try to get spares now. Even the opticians I go to say they love these and sell out as soon as they get them. These Oakley frames are very nice and feel very comfortable also seem to be quality made the frame material seem to be very strong. The only thing I don't like about these frames are the rubber stem covers - they seem to fall off quite easy when working in a hot environment and when you start to sweat they tend to slide off when taking off the glasses to dry off my head. Purchased glasses in Aug. 2012 took insurance for a year. The lens got scratched and were replaced in Aug. 2013. Last week one of the temple sleeves came off did not notice it and was lost. The other side is also loose. Went to LensCrafter to get new ones. I had to pay $10.00 for temple sleeves. Not very happy lens cost me $220.00. I also have a pair go sunglass style called flack. No problem. Why can't you make the temple sleeves so that they don't come loose. Very unhappy with this style. William Briere. These are good quality frames. Temples are just a little long, otherwise well crafted. I had sunglass prescription done on these Tumbleweed glasses and the grey looks great, not too dark and not too light. Fast turnaround from FramesDirect.com, less than 2 weeks.